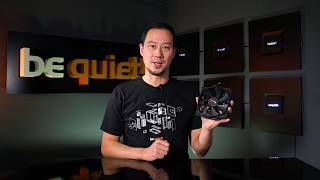 SILENT WINGS 3 | 120mm silent high-end Fans from be quiet! be quiet! 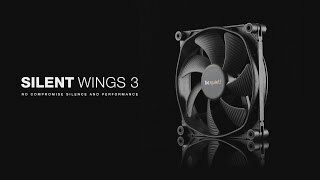 Silent Wings 3 120mm stands for state-of-the-art technology, virtually inaudible operation and superior cooling. It meets all the requirements to be a perfect choice for heat sinks, PC cases and radiators. 6-pole fan motor with three phases for very low power consumption, less vibration and therefore quiet operation of max. 16.4dB(A). Advanced high-quality IC motor controller reduces electrical noise. Seven fan blades with an optimized surface structure ensure virtually inaudible operation and excellent airflow. Removable anti-vibration mountings on all four edges of the fan reduce vibrations transmitted to the PC case to an absolute minimum. The rubberized fan frame is equipped with funnel-shaped air inlets for excellent air circulation and extremely high air pressure, which makes the fan the perfect choice for gaming and multimedia PCs, overclocked systems and for use with radiators. The advanced fluid-dynamic bearing (FDB) enables a super long fan life of up to 300,000 hours and greatly reduced operating noise.